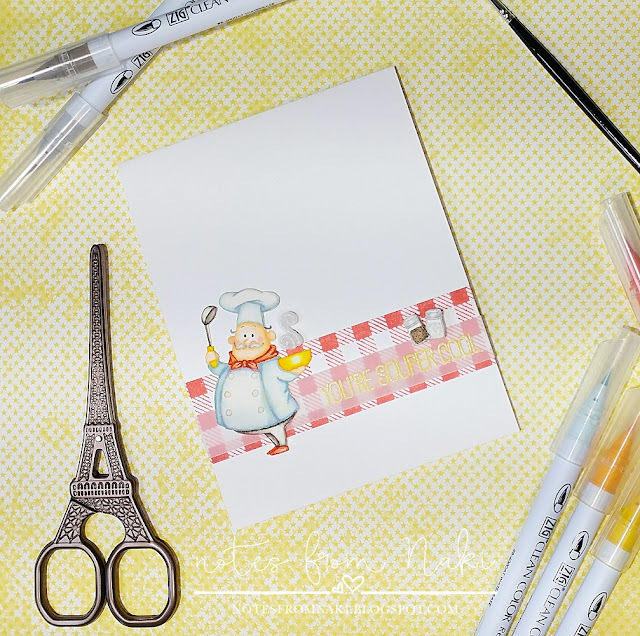 Today I am sharing this card I made to enter the Freshly Made Sketches Challenge! 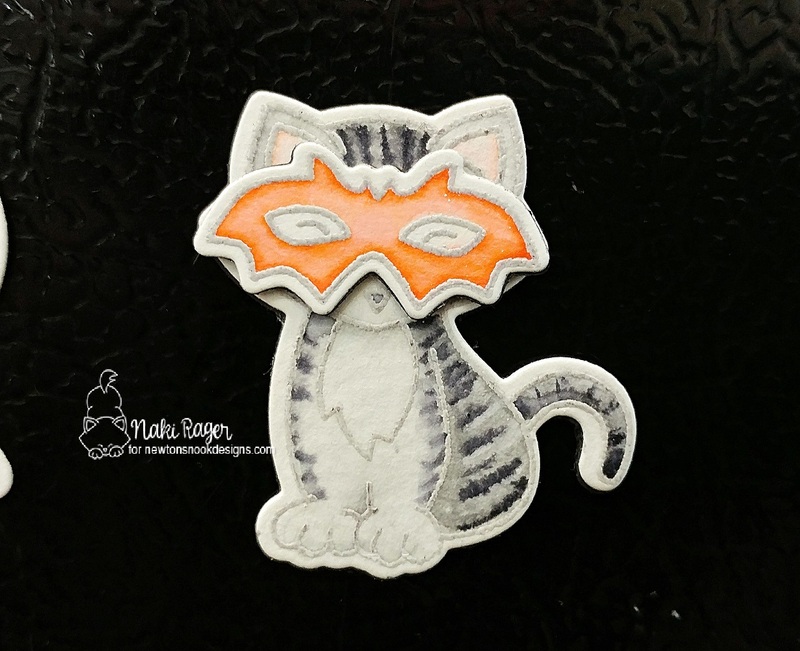 Isn't this a fun sketch!? 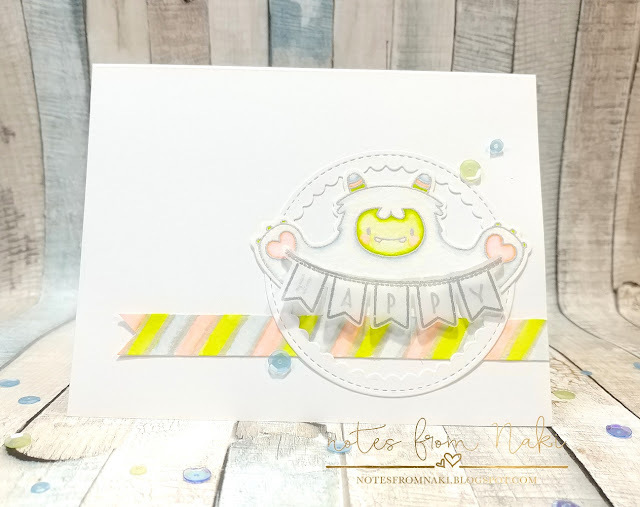 I LOVED Jen's card with this sketch, and it totally inspired me to play along! My little sister's birthday is next month (we're Irish twins, 11 months apart!) 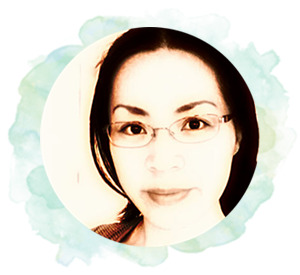 so I figured I'd make something for her ;-) We haven't seen each other ever since I left Japan 19 years ago! I miss her so much, thank goodness we have all these technologies now! I needed a thank you card, and the recipient used to have this awesome doxie named Danny, so I grabbed the Dress Up Doxies set immediately! 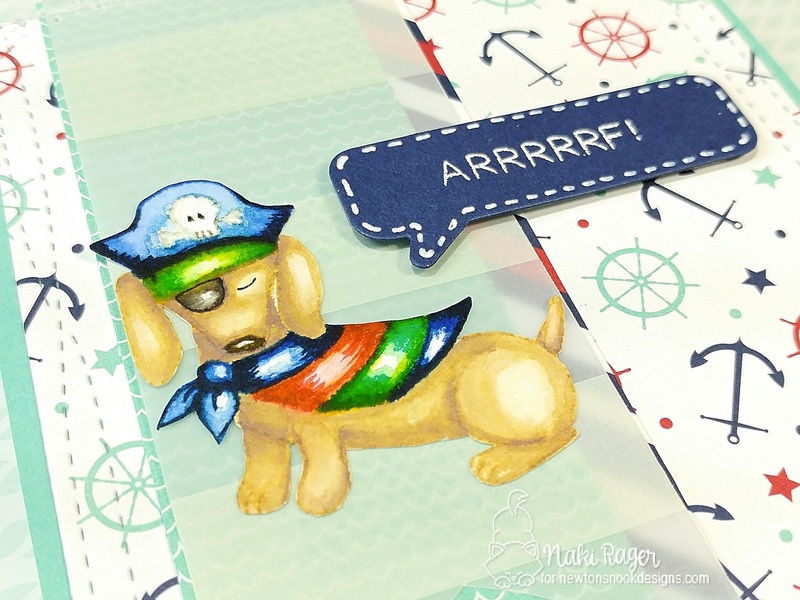 I stamped this matey with Antique Linen Distress Ink on watercolor and colored him with Zig Clean Color Real Brush set as usual. Danny was chocolate colored and that's what I started with, but oh man, I simply cannot color well with dark colors! So I tried again with this lighter brown. 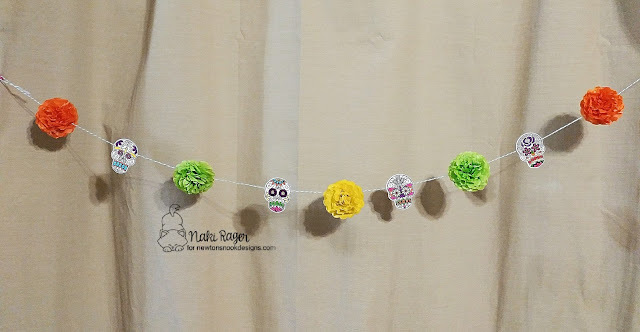 As you can see, I did color his scarf with bright colors to coordinate the patterned papers (sort of...lol) though. My dad is a chef and his birthday is in less than 2 weeks! What stamp set is more perfect for him than this Recipe for Happiness set from My Favorite Things!? 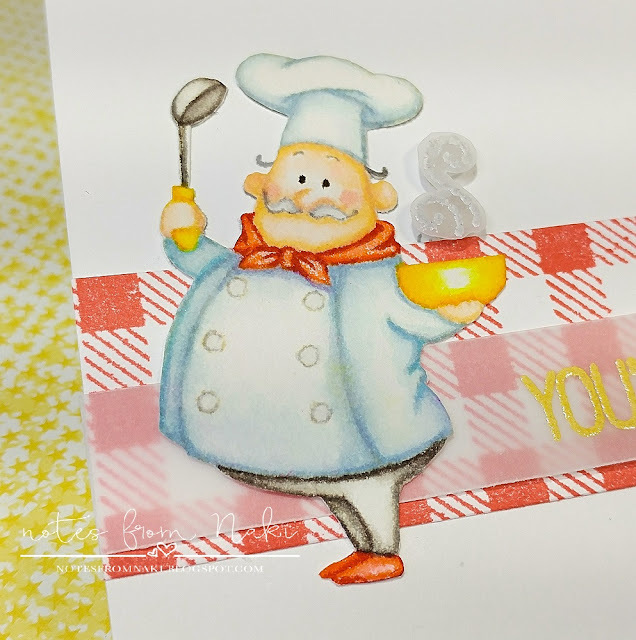 I stamped this charming chef image with Antique Linen Distress ink on watercolor paper and colored him with Zig Clean Color Real Brush set. 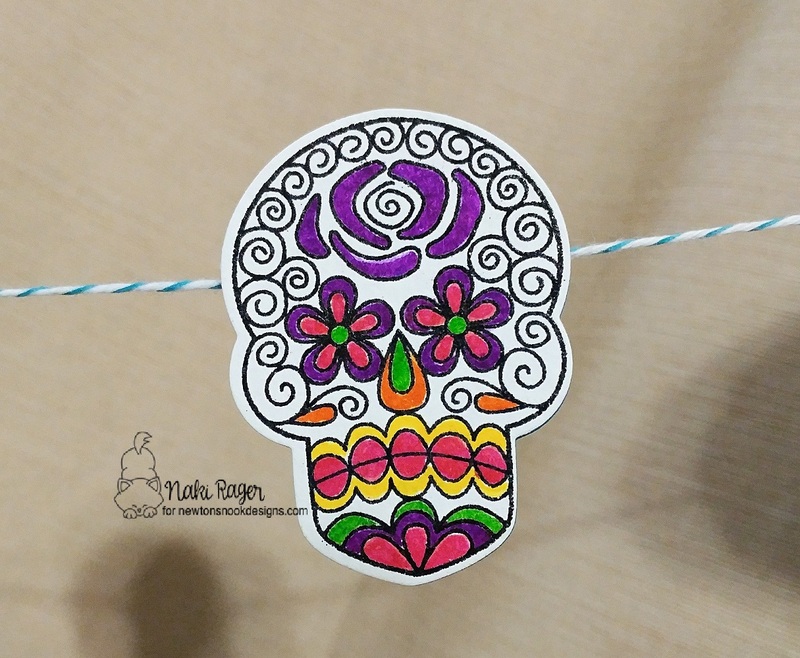 He was so very fun to color! I also stamped the salt/pepper shaker image twice to add, aren't they just the cutest salt/pepper shakers!? 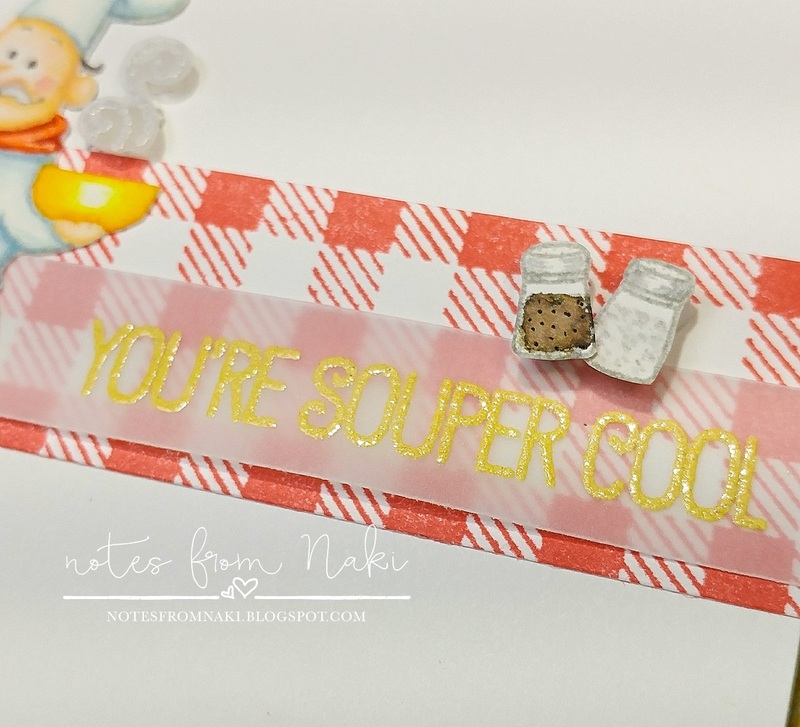 This super fun sentiment compliments the chef with the soup image perfectly! I pick out the yellow from his bowl and the handle of the ladle. 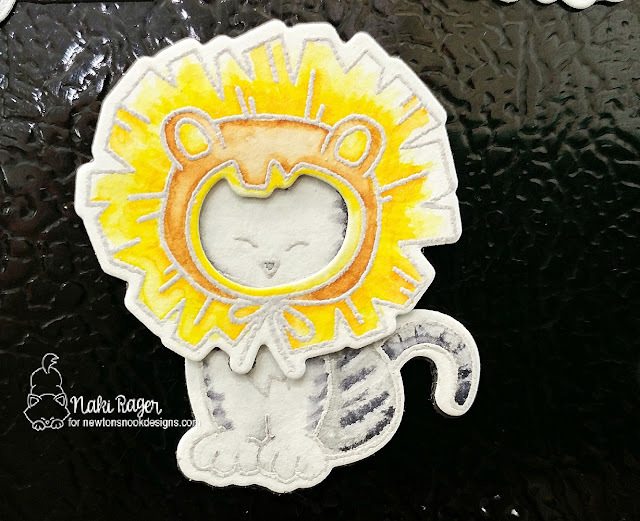 I am here with another card I made for the My Favorite Things Design Superstar Contest! This one is for the Clean and Simple Genius category! The first thing I did was die cut the front panel with the Wonky Stitched Rectangles STAX. 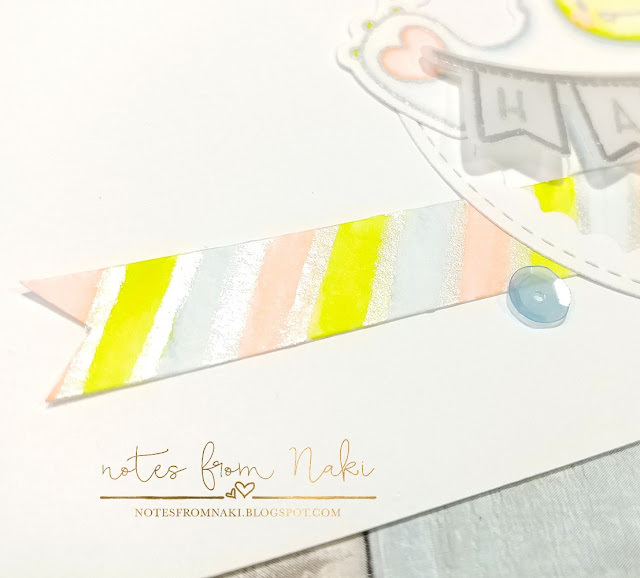 I masked the top part of the panel to sponge with yellow first, then heat embossed the sentiment with white embossing powder. 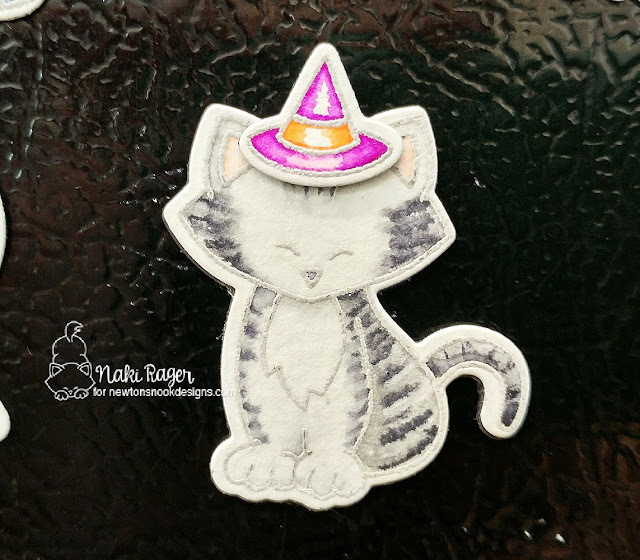 This kitty from the I knead You set is so stinkin' cute! 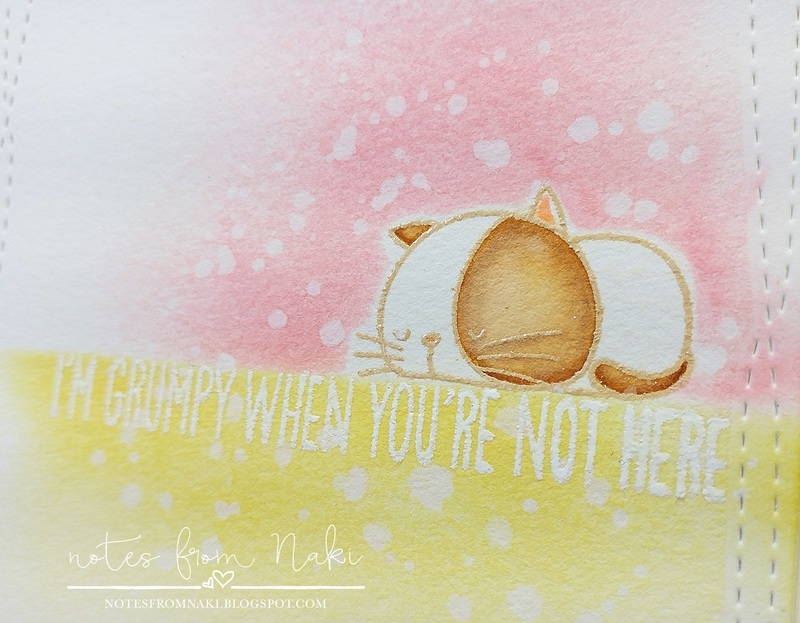 I heat embossed him with tan embossing powder right on the sentiment so he looks like he is laying on it. 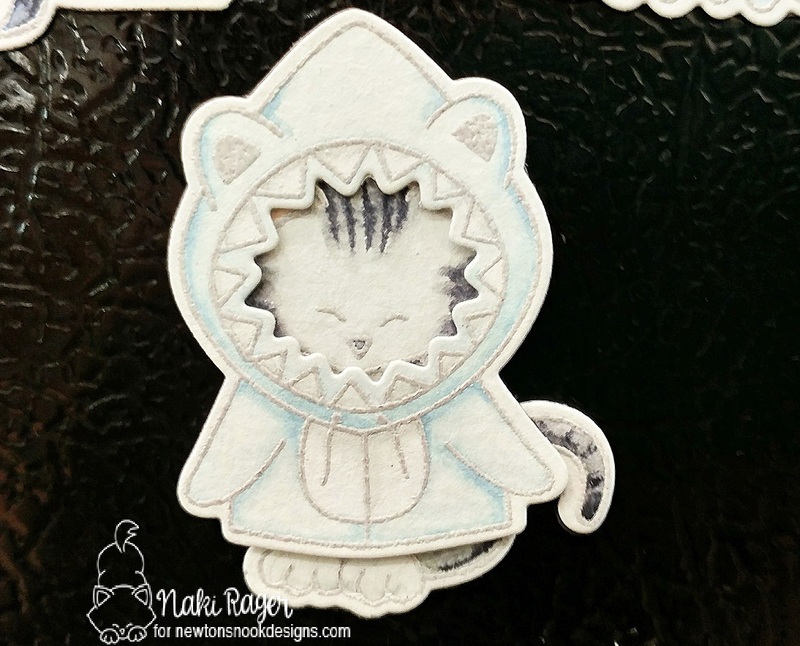 After coloring this cutie, I used the I knead You die set to die cut the same kitty from a scrap to mask him, then sponged around him with pink, and splattered some water. I'm going to try to create another card for the last category so stay tuned! 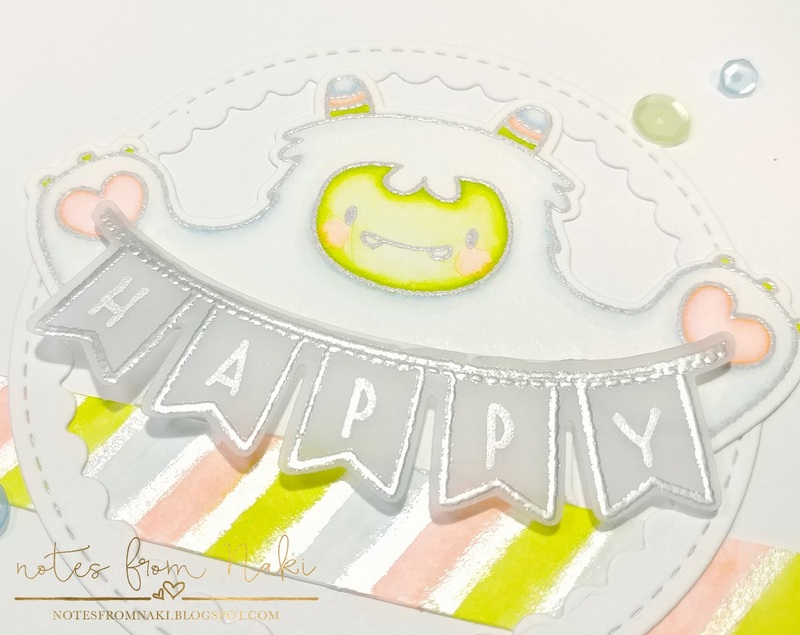 I'm making a quick stop to share this card that I made for the My Favorite Things 2017 Design Superstar Contest today! They have 3 categories and I am entering this one to the Innovation Master! All the images were heat embossed with light gray embossing powder on watercolor paper, water colored with Zig Clean Color Real Brush set, then fussy cut. The Stitched Scallop Circle Die-namics was used for my little background, which was sponged with Distress Oxide ink in Broken China and Cracked Pistachio, and splattered some water, then added tiny dots with white acrylic paint using the top of a paintbrush. Of course, I had to make the double-decker bus go! 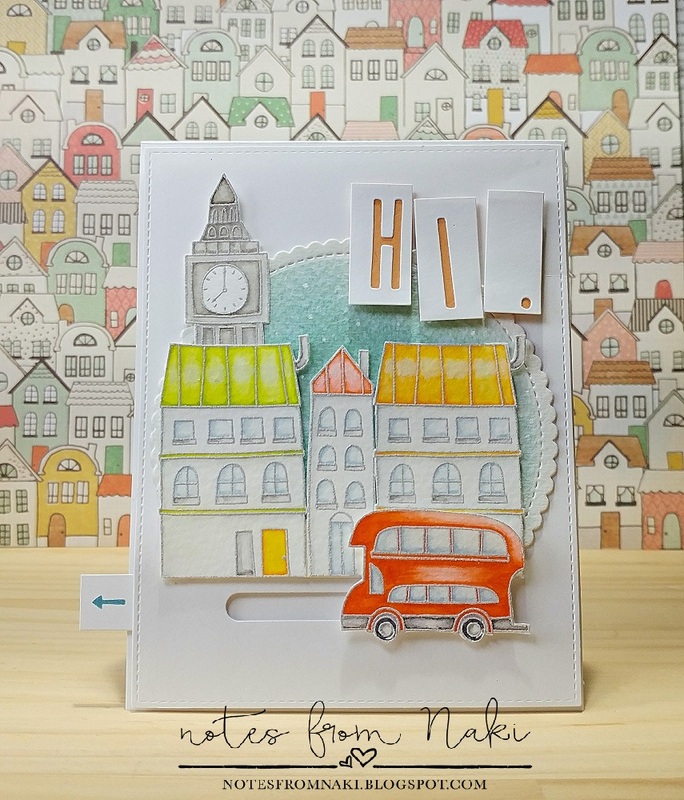 The Big Ben was mounted on the scallop circle, the adorable houses were popped on with foam tape, and I used thicker foam tape to place my lovely bus ;-) I didn't have a sentiment that would go well with this little town, so I die cut "HI." with the Emmitt Alphabet Die-namics from white cardstock, chopped them, then mounted them onto a peachy cardstock. 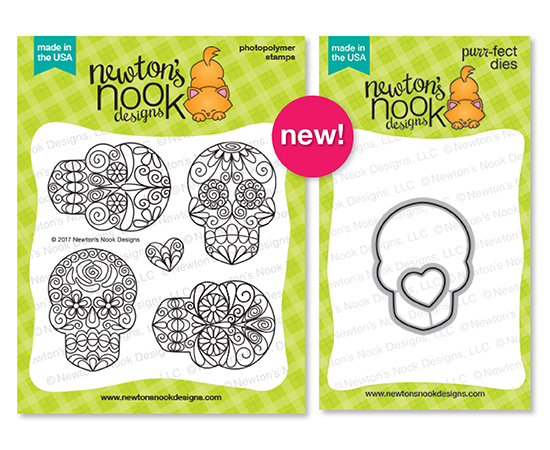 Welcome to the final day of the Newton's Nook Designs September Release! 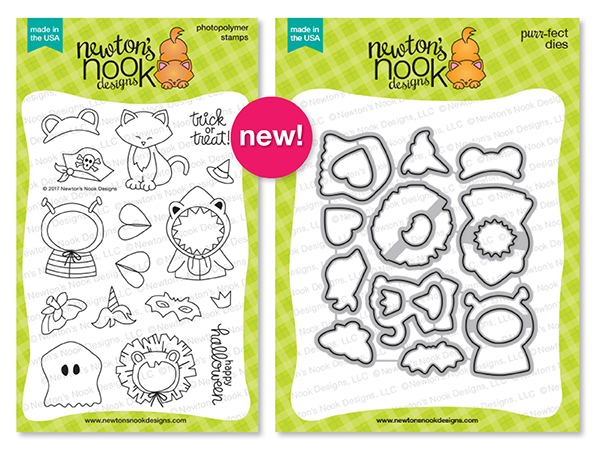 All the new sets will be available for purchase tomorrow, Friday the 15th in the Newton's Nook Designs shop! Today is day 4 of the reveal, and we are showcasing this ADORABLE Newton's Costume Party Set along with the coordinating die set! 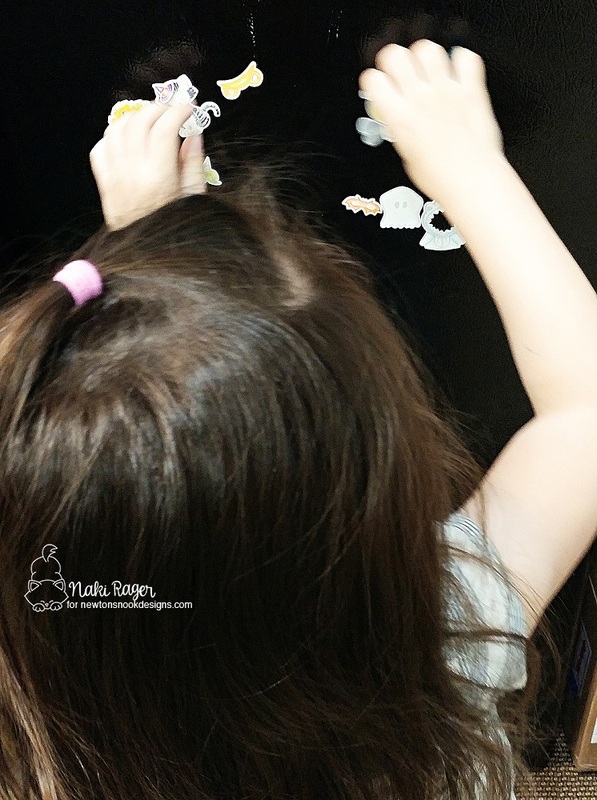 It's super fun for little ones for sure! Hope you enjoyed all the reveal this week! Don't forget to check your budget and go shopping tomorrow! 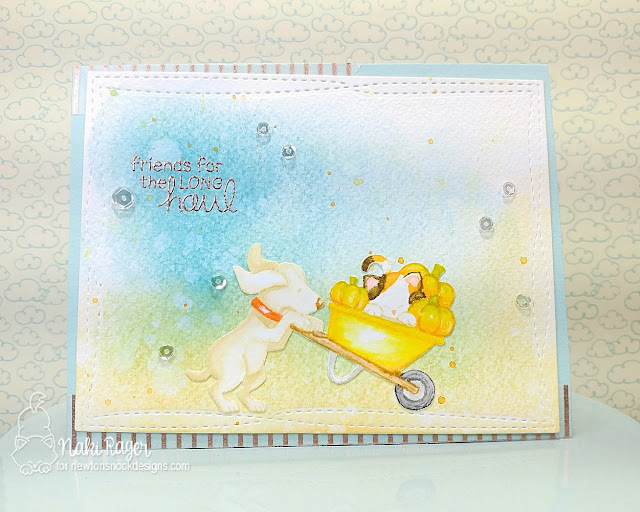 Welcome back to the Newton's Nook Designs September Release! 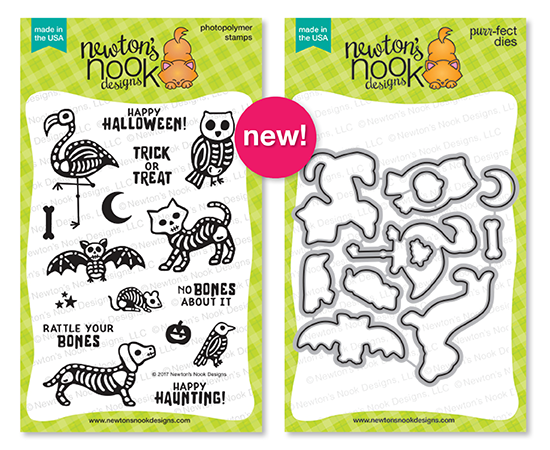 All the new sets will be available for purchase this Friday the 15th in the Newton's Nook Designs Shop! Today is day 3 of the reveal and we are showcasing 2 fabulous set along with the coordinating die sets! 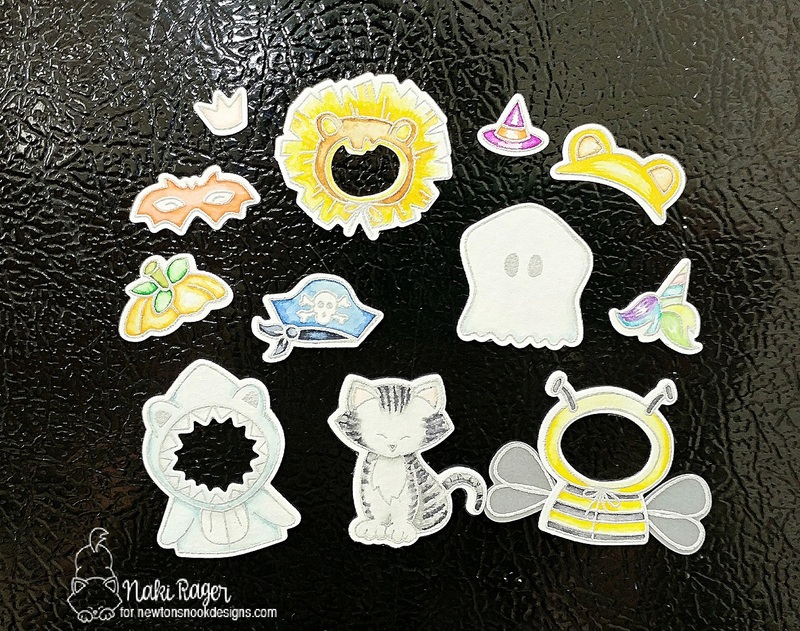 I hope you're ready for more Halloween fun! 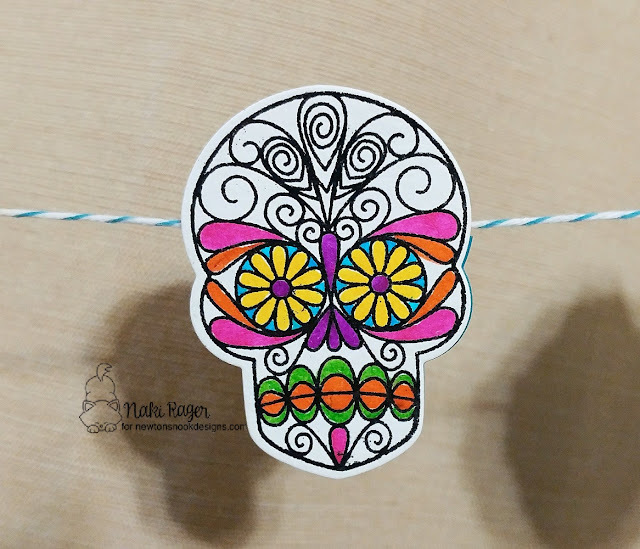 Aren't these intricate designs just simply beautiful!!? How does Jen draw something like this!!? This set is so fun, I can't wait til it' Halloween!!! I borrowed that fabulous spooky mansion from the Spooky Street set to create a Halloween night scene. 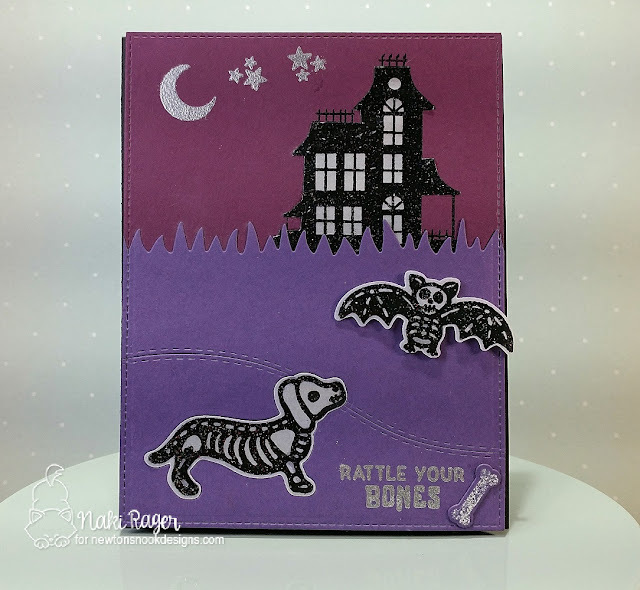 The sky and grass are creepy purple, the moon and stars are shining silver, and there are animal skeletons walking around! 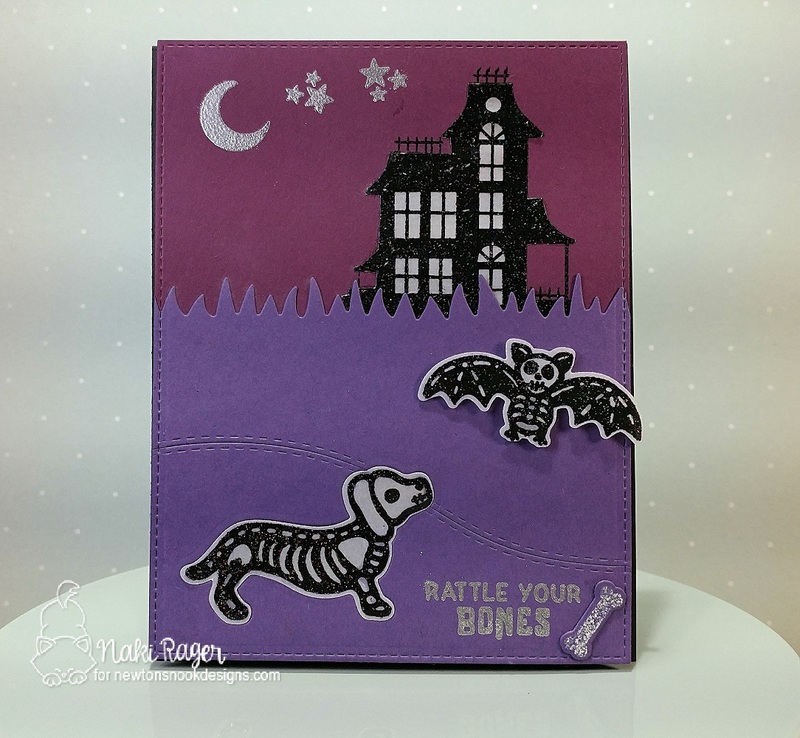 After everything was assembled together, I thought to myself, I should have used some fun patterned papers instead of solid purple...:-( So why didn't I make another one? Because I used the Chibi lights to make it super spooky! 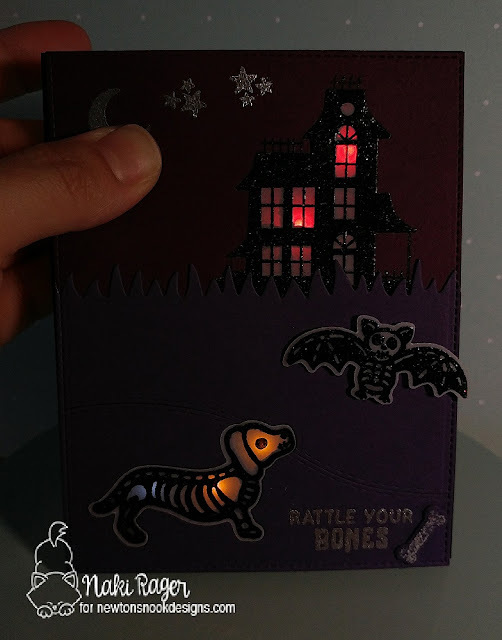 The mansion and dog were heat embossed with sparkle black embossing powder on vellum so that the lights can come through easily ;-) The bat was added after it was put all together and that's why he doesn't light up. How they paint their faces with beautiful, bright colors is simply amazing! That is a work of art for certain! 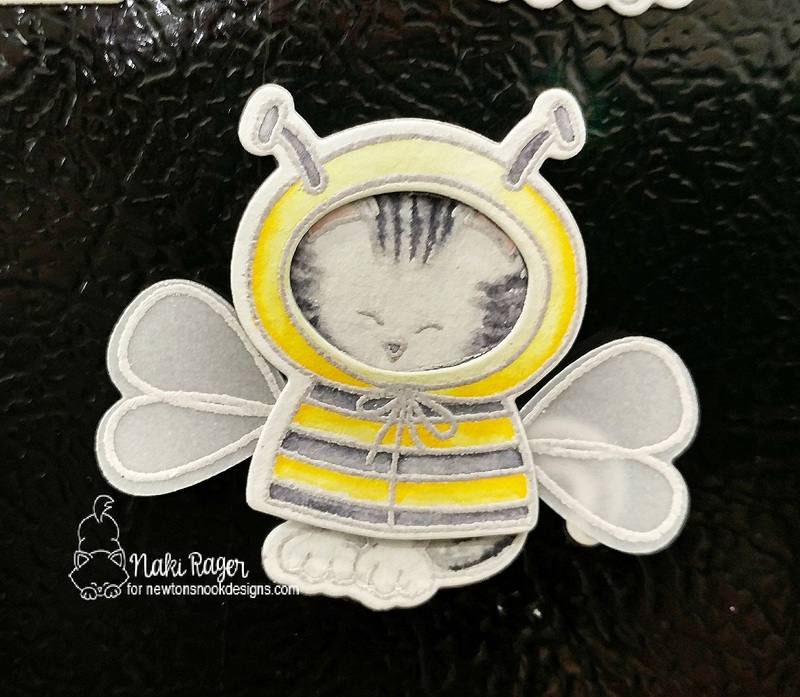 So I heat embossed all 4 images with black embossing powder on watercolor paper, colored them with my Zig Watercolor pens, and die cut them with the coordinating die. I did not use ant water like I normally do, these pens have intense colors and that's what I wanted. 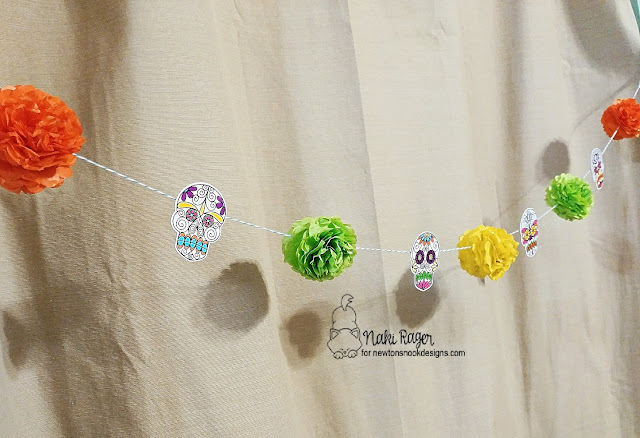 They decorate for this celebration and I saw a ton of pretty flowers in the photos. We have one more set to reveal, and you really don't want to miss this one!!! 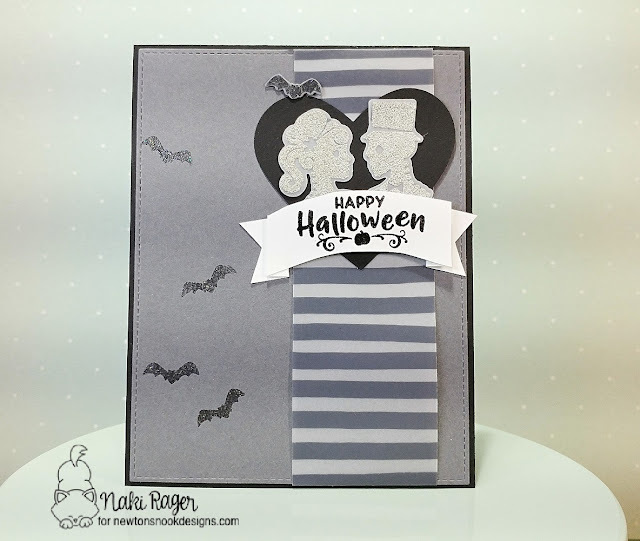 On day 2, we are showcasing the Spooky Cameo Set along with the coordinating die set, plus the Cameo Frame Die! Isn't this so totally awesome!!? 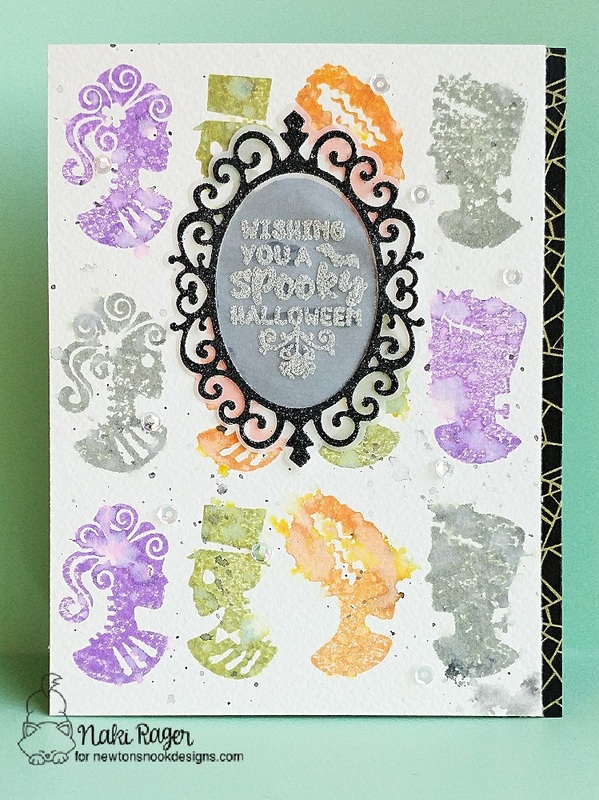 This stamp set reminds me of the Haunted Mansion at Disneyland/world, so fun! Those silhouettes were stamped with typical Halloween colors with Distress Oxide ink, then I splashed some water and black ink. 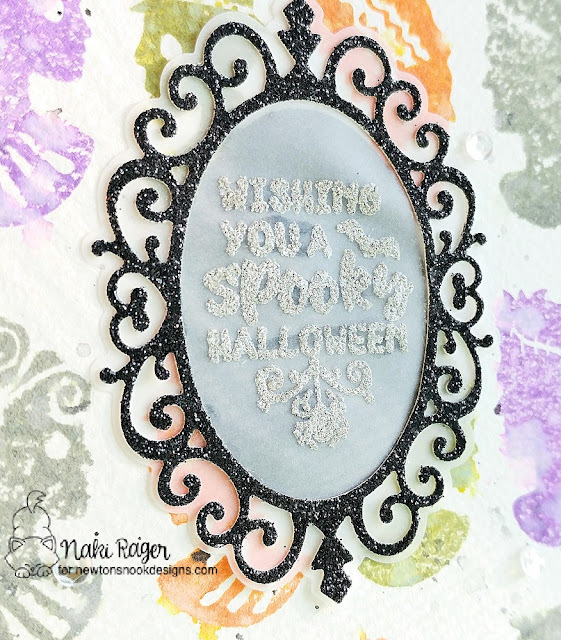 The Cameo Frame was die cut from black glimmer paper, isn't it just awesome!? I heat embossed the sentiment with pumice stone embossing powder on vellum then it was die cut with the outline of the frame die, and the black frame was mounted on. I added a black oval piece behind so the sentiment is more visible. I think this turned out really fun! We have 2 more reveal days left so do come back! Have you heard of STAMPtember? 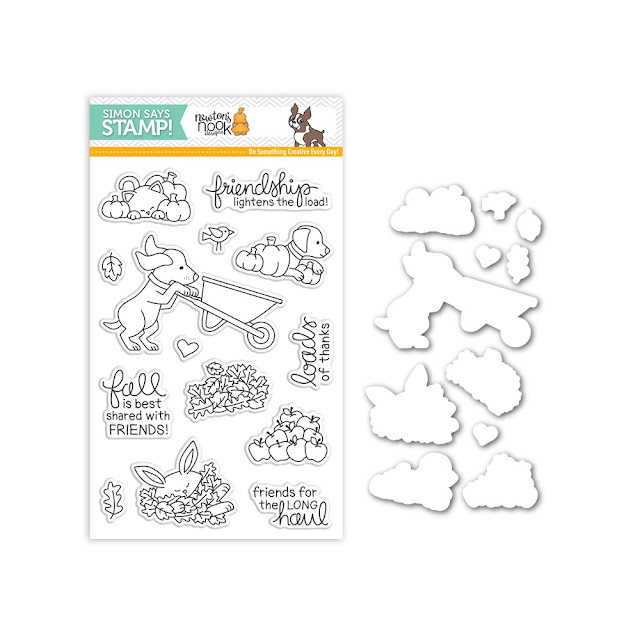 Over at Simon Says Stamp, they collaborate with many of the manufacturers that they carry in thier shop and make exclusive stamp sets that are only available in the Simon Says Stamp Shop in September! 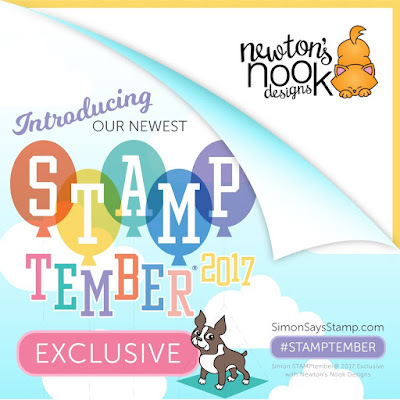 And Newton's Nook Designs is participating again this year! I literally squealed when I first saw this set! 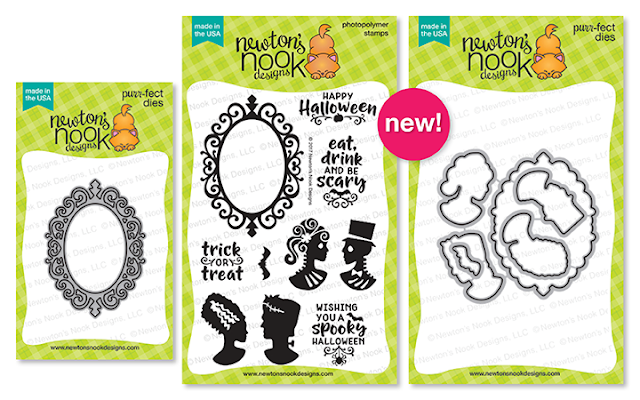 Welcome to the Newton's Nook Designs September Release Week! 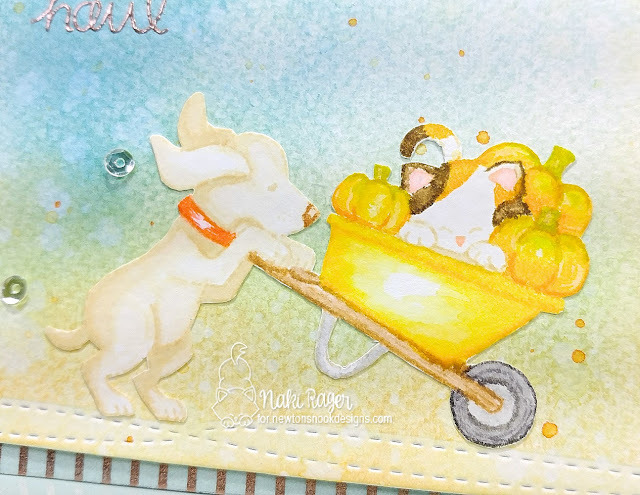 On day 1 of the reveal, we are showcasing this gorgeous set, Shades of Autumn! 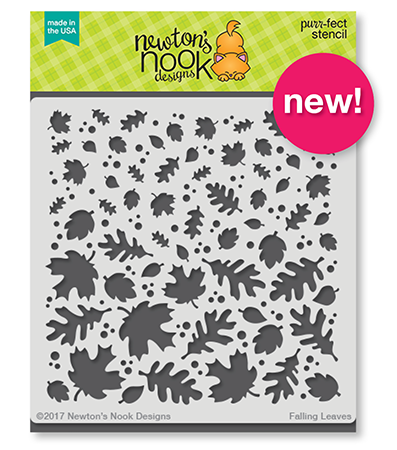 If you love pretty fall leaves, this set is definitely for you! Does this set just take your breath away!? 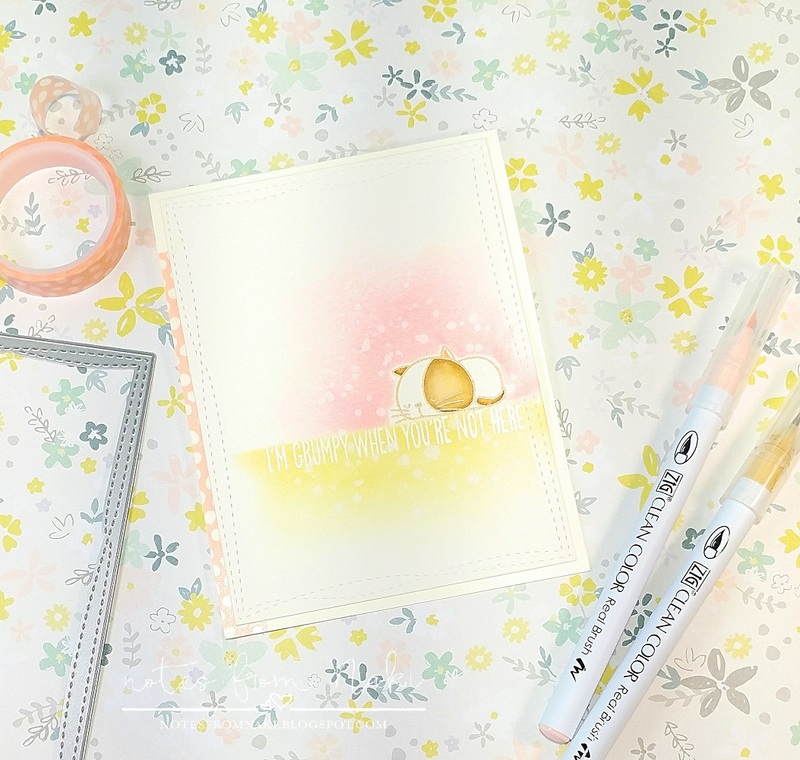 Wait until you get your hands on this beauty and stamp yourself, it is simply beautiful! I picked all those beautiful fall colored sequins, plus gold bead seeds. 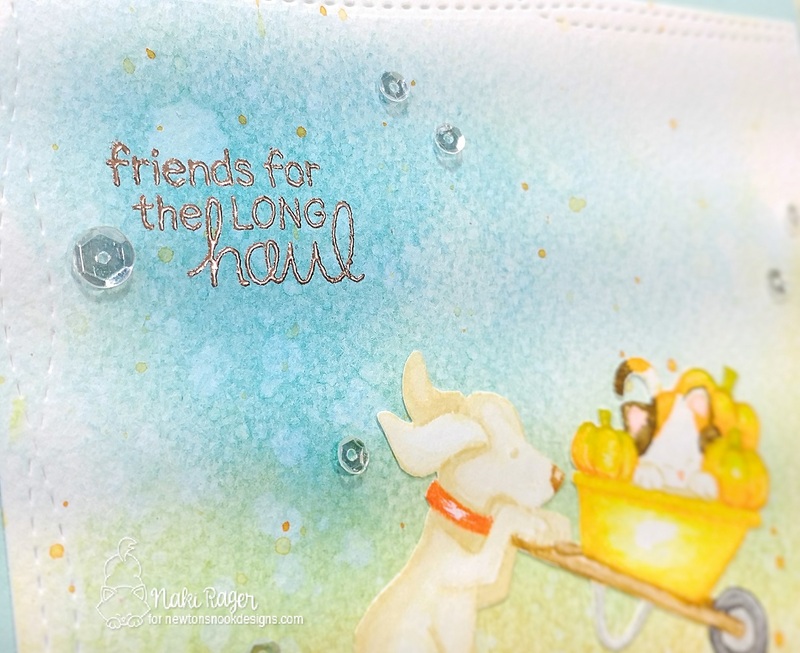 This gorgeous sentiment was heat embossed with copper embossing powder on yellow vellum. 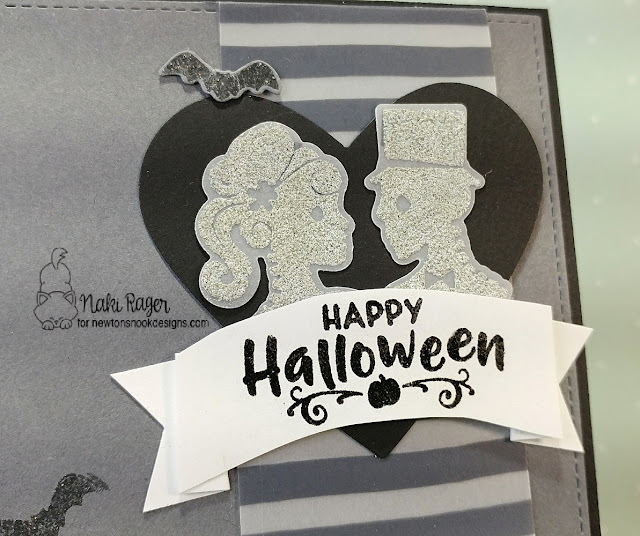 I sponged versamark on Crumb Cake cardstock over the stencil then heat set with white embossing powder. Isn't it just gorgeous!? Make sure to come back tomorrow, you don't want to miss this awesome new set!